Beautiful showy purple flowers, a useful medicinal root and hardy in central Alberta, our appreciation of Baical skullcap continues to grow. Can be started in plug trays or seeded in the garden in early spring. Needs full sun and good drainage. Plant 6 mm (1/4 in) deep and expect germination three to four weeks after it rains. 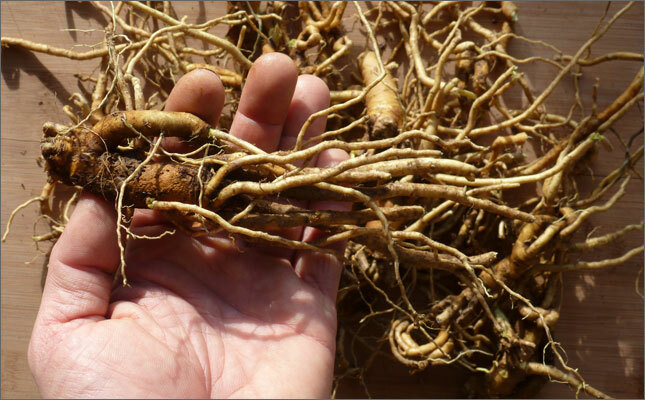 Overly fertile soil is said to produce medicinally inferior roots - sandy poor soil would be ideal. Space plants 25 cm (1 ft) apart. Roots can be harvested starting in the 2nd year - wait until late fall to dig, then wash, slice and dry the small yellow roots. Produces more flowers each year as it gets established, and the viability of the seed also improves with age. Baical skullcap is an important herb in Chinese herbalism, where it is known as Huang-qin. Produces flavones such as baicalin and wogolin that are thought to be the active compounds. We use the dried powdered root as an antiviral - also said to be good for gastrointestinal infections such as dysentery.